Thank you for your interest and participation in our inaugural Nanobiosym Global Initiative Summit (NGI Summit) hosted in collaboration with Scientific American Magazine. The NGI Summit held on September 27-28, 2014 on the Harvard Campus in Cambridge, MA was the first time we brought together the Nanobiosym Global Ecosystem of stakeholders to accelerate the next generation of healthcare infrastructure - one that is more personalized, mobilized and decentralized. The NGI Summit assembled an entire ecosystem of early adopters and change agents to help pilot and integrate next-generation technologies, and raise the consciousness with which we deploy transformational solutions to maximize their sustainable impact on the world. Since winning the XPRIZE for our Gene-RADAR® mobile diagnostic (Nanobiosym XPRIZE Video), Nanobiosym has emerged from stealth mode to the global stage. We find ourselves at the tipping point of an industry on the verge of disruption and at a point in history where recent technological advances—smart phones, information and communications technology, human genome sequencing, bioinformatics and the new science of nanobiophysics—are poised to completely transform the delivery of global healthcare. What Google did for the information industry and cell phones did for telecommunications, we at Nanobiosym aim to do for healthcare. But we recognize that disruptive technologies alone are not enough to drive the revolution in global healthcare; we need an entire ecosystem. As you know, we face an impending multi-trillion-dollar crisis in the United States as our healthcare system grows more complex, with highly specialized and overpriced reductionist silos that seek to cut costs by adopting a “one size fits all” mentality. Worldwide, nearly 4 billion people lack access to basic healthcare. This includes both the developing world and rural, remote areas (even in industrialized nations) where people do not have access to nodes of concentrated healthcare infrastructure. We examined some of the landmark opportunities and challenges that we face at this juncture in history and showcased some of our global partnerships across traditional academic, industrial and geopolitical boundaries that are working closely with us to create a new paradigm for healthcare. We also announced new commitments and partnerships from stakeholders who have joined us in a commitment to providing access to technologies that are transforming global healthcare. 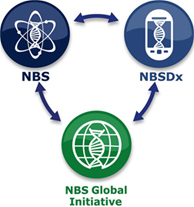 Our Nanobiosym Global Ecosystem of stakeholders comprises global thought leaders, business leaders, heads of state, Nobel Laureates, leading CEOs, heads of foundations and NGOs, major philanthropists, and members of the media. I encourage you to join our Nanobiosym Global Ecosystem and welcome you aboard our journey to rewrite the rules in the healthcare industry enabling exponential democratization of access on a global scale. Dr. Anita Goel, M.D., Ph.D.